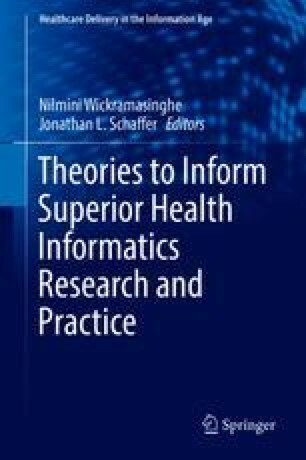 This chapter considers how assimilation theories can be used to explain success with the adoption and use of healthcare information systems in public hospitals. A number of authors have explored the applicability of innovation assimilation theory, technology-organisation-environment model and resource-based theory to the IS/IT domain, mainly at a conceptual level. Overall they infer that stages of assimilation begin from the organisation’s initial evaluation to its formal adoption and end with a well-accepted deployment of the system to a point where it becomes part of the value chain activities in the organisation. This paper is based on in-depth single case study research in a public healthcare facility, which identified global and local barriers to the assimilation of the HIS, with the people, process, technology and environment components as key facilitators for success. These factors together provide the motivation for this study in developing a technology innovation assimilation model for hospitals to successfully assimilate their healthcare information systems (HIS). Successfully assimilating HIS is also seen as having a possible impact on decreasing technology, organisation, environment and process issues pertaining to acquisition and deployment.